In yoga culture, we hear a lot about “finding your voice” and “teaching from the heart,” but what do those statements mean exactly? I know when I first started teaching, I was far more concerned with not mixing up my rights and lefts than I was with teaching my truth. Mostly, I was just focused on not messing up, but I was also really concerned with sounding yogic enough. I didn’t want to be myself. I wanted to be a yoga teacher. I thought I needed to have all the answers—to be a master of physiology and philosophy at the ripe old age of 20. I struggled with the flowery, poetic words that seemed to come easily to the teachers I admired, feeling awkward and unnatural with language like “heart opening” and “shining brightly.” I spoke with my yoga voice—a soft, lilting, head-voice that I hoped sounded ethereal enough to drown out my awkwardness. Secretly, I felt like a yoga fraud. Playing the role of yoga teacher was draining, demoralizing, and ultimately unsustainable. I didn’t want to be myself. I wanted to be a yoga teacher. 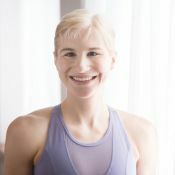 Thankfully, before the grueling Stepford-Yogi act turned me off down dogs (or at least teaching down dogs) for good, I managed to connect with seasoned teachers and mentors who showed me a few tricks of the trade language-wise, and more so, helped me develop the confidence to teach as me. Often this meant—and sometimes still means—(lovingly) calling me out when I reverted to “yoga-speak.” By yoga-speak, I mean the speech patterns, habits, and clichés that we tend to fall into when trying to sound how we think a yoga teacher should sound. The trouble with yoga-speak is that it creates a barrier between teachers and students, often making us come across as perfectly polished, sing-songy yoga-robots (yobots?) instead of real, live, flesh-and-blood humans. And most of all, it prevents us from teaching as ourselves—the unique, interesting, adept, yet (charmingly) flawed teachers that we are. “Engage your root lock.” “Hug the midline.” “Take a vinyasa.” Don’t get me wrong, all of these are excellent cues, but they’re meaningless if your students don’t have any idea what you’re talking about. Case in point: As an Anusara-trained teacher, I once asked a friend to “puff up your kidneys like two little balloons.” She immediately burst out laughing and said, “Kat, what the hell does that mean?” I had to laugh, too. All I really meant was “don't arch your lower back so much,” but I was so caught up in saying the “right” thing that I forgot that the Anusara-speak would make zero sense to my friend, who normally practiced a different style of hatha. Don’t get me wrong, all of these are excellent cues, but they’re meaningless if your students don’t have any idea what you’re talking about. This puts everyone on the same page and no one feels left out or confused because they’re not hip to the yoga lingo. For whatever reason, we yoga teachers love “ing” words. (“Inhaling our arms up, exhaling forward, inhaling halfway lift, exhaling downward facing dog….” You get the idea.) But when we slip into those long, sing-songy, run-on sentences with a seemingly never-ending string of “ing” endings, it’s easy for students to mentally check out. Perhaps because when we use passive language like this, it doesn’t seem so much like we’re talking to students as just, well, talking. I suspect that many of us use passive language because we want to come across as nurturing, inviting, and non-forceful. These are all good intentions, but intentions that can still be put into practice while speaking confidently and directly. Directness doesn’t preclude respect and kindness, rather it simply means speaking to your students: “Inhale your arms up. Exhale fold forward. Inhale, lift halfway. Exhale, downward facing dog.” See the difference? This doesn’t mean you can never again use an “ing” word; but if you tend to use them excessively when you teach, play with incorporating more direct language and see if you notice a shift in the energy of your classroom. “Good job” loses all meaning if you use it haphazardly with no context. Complimenting your students is a great idea. After all, affirmative words can be encouraging and empowering, but only if they're specific. Tell your students why they’re doing a good job: “Beautiful length in your spine, Sue,” “Great job keeping your thighs lifted, Steve,” etc. Not only does it feel more genuine, but it may actually enhance their alignment. If I’m holding cobra pose, for example, and my teacher commends the broadness of my collarbones and the lift in my sternum, you better believe that I’m going to see if I can find just a little bit more openness and lift. Same goes for affirmations directed toward your entire class. It’s the difference between “Nice work,” and “You guys are all really strong and steady in your planks today.” While the former can come across as (and often are) filler words to break the silence, the latter is specific, relevant feedback that tells your students that you’re present with them, that you’re paying attention, and that you notice their efforts and progress. Here’s a tip that has been a HUGE help for me and one that I often share with the new teachers that I mentor and train: Teach as though you were teaching a group of your closest friends or family members. You don’t have to perform. You don’t have to play a role. You don’t have to sound ethereal. Just speak in your regular voice and tell them how to do the pose. And from there, let your personality shine through! If you’re a poetic person, embrace your inner sonnetist. But if you tend to be more straightforward and literal, you don’t have to force the flowery language—especially if it feels disingenuous. If you’d rather wax philosophical on the psoas than paraphrase Rumi, you do you. Your individual style isn’t going to appeal to every student—no teacher’s will—but it will attract the students who want to learn what you have to teach. As teachers, it’s important to be mindful of our language choices, for sure, but it’s also easy to get SO caught up in saying everything “right” that we forget to be ourselves. Ultimately, it’s not a huge deal if you said “um” 12 times, mixed up your right and left, or forgot to call a pose by its Sanskrit name. If you’re teaching from a place of authenticity, it’s going to resonate with your students. I know that I found when I shifted my aim from being “perfect” to being authentic, teaching became a lot less stressful, a lot more fun, and way more sustainable. Seriously, constantly trying to measure up is exhausting! After all, it’s awfully hard to find your voice if you feel like you have to be somebody you aren’t.